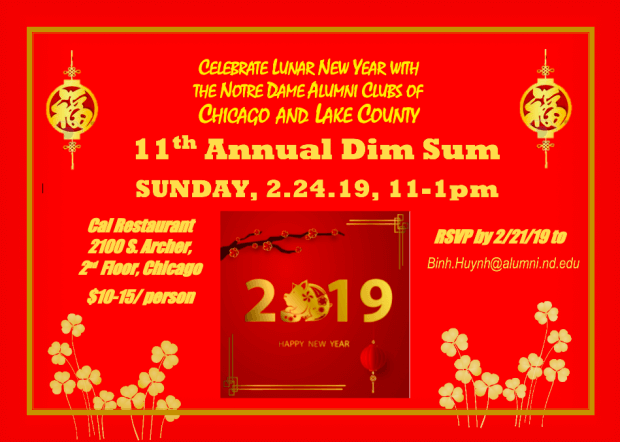 Celebrate the Lunar New Year (The Year of the Pig) by joining the ND Clubs of Chicago and Lake County for the annual Lunar New Year Dim Sum Brunch on Sunday, February 24th at Cai Restaurant in Chinatown! Dim Sum is basically little appetizers that are [very] delicious. There will be cuisine for all food orientations (dumplings, meat and vegetarian dishes, bakery sweets, etc.). The best part is that you can sample several dishes instead of ordering just one entree to share amongst your table! To learn more about Dim Sum, click here. EVERYONE is invited! Alumni, family, friends – of all ages. This event is brought to you by the Diversity Comittee of the ND Club of Chicago and Lake County, sponsored by the Diversity Counsil of Notre Dame. Please RSVP to Binh Huynh (Binh.Huynh@alumni.nd.edu) by Feb. 21st so we have an accurate headcount for our reservation. Restaurant: Cai Restaurant, 2100 S. Archer Ave, 2nd Floor, Chicago, IL (Corner of Wentworth). (312) 326-6888. Reservation: Reservation is under Notre Dame Club for 11:00 am. Parking: Parking is available on the street or in a lot across from the restaurant (only $1 with restaurant validation). CTA Red Line stop “Cermak/Chinatown” is also nearby. Cost: $10-$15 per person – depending on how many people attend and how much is ordered family-style. Payments can be made after the meal by cash or Venmo/Paypal/QuickPay.